Lauryn Evarts Bosstick recently shared her appointment with Dr. Devgan for all her followers to see. Bosstick is known for turning her passion for beauty and wellness into one of the most distinctive blogs online today, The Skinny Confidential, as well a her book, The Skinny Confidential Lifestyle Guide. This isn’t Bosstick’s first time openly discussing a procedure. Known for her authenticity and lack of censorship, she is a leading consumer voice in the field of medical aesthetics and has spoken publicly about her breast augmentation and Botox, helping to destigmatize the plastic surgery industry, much like Dr. Devgan, herself. 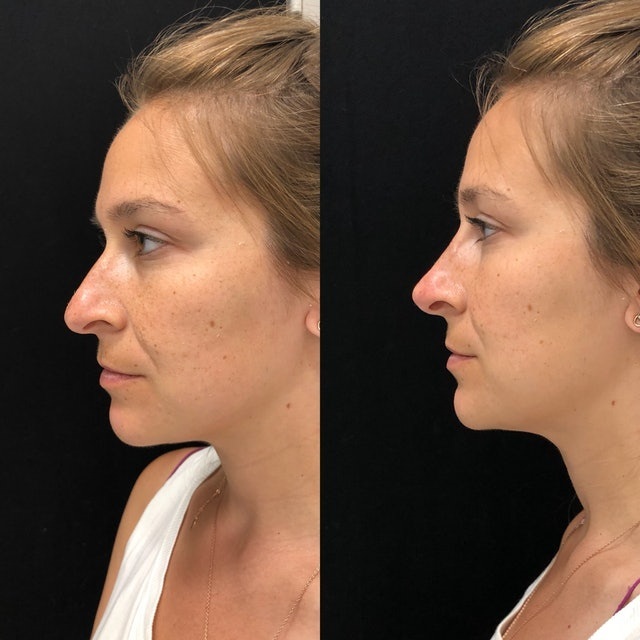 Seeking Dr. Devgan’s precision and expertise for her lips, she asked for more volume, but also to correct slight asymmetries left behind from past jaw surgeries. She and Dr. Devgan establish a candid dialogue about Bossticks’ goals and concerns in regards to the procedure, ultimately allowing a strong doctor-patient collaboration to unfold. HealthyWomen.org published an article entitled “Are Breast Implants Safe?” which examines the recent FDA report connecting women with breast implants to “breast implant-associated anaplastic large-cell lymphoma (BIA-ALCL),” an immune system malignancy. The issue has brought into question the difference between smooth and textured implants, as the lymphoma has been more common in those with textured implants. Most implants used in the United States are smooth, and the majority of doctors still stand behind the procedure, as the data collected thus far is imperfect. Dr. Devgan says, “All surgery has risks, but I believe that breast implants are generally safe devices that can bring a tremendous amount of joy and satisfaction to women. Our knowledge of science is ever evolving. But I would recommend breast implants to a patient, friend or family member who desired them and was an appropriate medical candidate." Read full article here. BRIT+CO recently published an article entitled “This New Microneedling Facial Might Replace the Vampire Facial” which highlights one of Dr. Devgan’s signature procedures, the Gold Microinfusion Facial. “It’s an amped-up, medical-grade version of traditional microneedling with added special ingredients like Botox, hyaluronic acid fillers, and platelet rich plasma (PRP) to give the skin an extra glow,” Dr. Devgan describes. Dr. Devgan customizes each blend of ingredients, depending on the specific needs of the patient. With the use of single-bore hollow needles, the blend (or “cocktail” as Devgan calls it) is injected into the dermal layer of the skin. “The microneedling itself generates collagen; the Botox shrinks the dermal elements, creating poreless-looking skin; the hyaluronic acid plumps the skin; and the PRP is rich in regenerative growth factors that ramp up stem cell activity, which boosts collagen and makes the skin look beautiful,” Devgan adds. Read the full article here. Miss Manhattan America, the official preliminary competition of Miss New York, crowned it’s 2019 winner, Kristina Tubera, who accepted her honor clad in tiara, sash, and Dr. Devgan’s Platinum Lip Plump. Tubera also utilized Dr. Devgan’s Platinum Long Lash Serum and Platinum Magnetic Kinetic Mask in preparation for the event. Dr. Devgan’s Scientific Beauty Skincare Line has been featured in InStyle, Vogue, OK Magazine, and on some of the most beautiful faces around the world. The Platinum Lip Plump promotes lip hydration, visible volumization, improvement in pink color, and anti-oxidant protection immediately upon application. "The lips are one of the most beautiful facial features. Platinum Lip Plump is hands-down my favorite product for healthy lips. Not only does it provide the gorgeousness of a fuller looking pout and pinker lips, but it also gives the lips hydration, protection, and nourishment," says Dr. Devgan. Scientific Beauty products can be purchased online here.